I dreamt of this combination one recent night. Luckily for me I keep a notepad and pencil on my bedside table (along with many tubes of hand cream for my dishpan hands), so was able to capture it before it slipped away into the dawning light. The sharpish, minerally flavours of the strudel with the almost-sweet, Spanish inspired flavours in the tomato fondue may sound unusual, but I do think they work. Whoever said ‘dreams can come true’ was right on this occasion. We wolfed down both strudels before I could take more than a few photos. I could however have taken a lot of pictures of flaky crumbs and smiling faces. This makes two long strudels, so halve the recipe if you only want one. A single strudel will serve about three people for a main course. You could probably freeze one and cook from frozen, but I haven’t tried it. If you do that I would add a bit more cornflour. The thick and exceedingly more-ish fondue – perfect to celebrate British Tomato Week – is enough for both strudels, with a bit extra for having on bruschetta or to extend an existing pasta sauce; lots of potential uses. 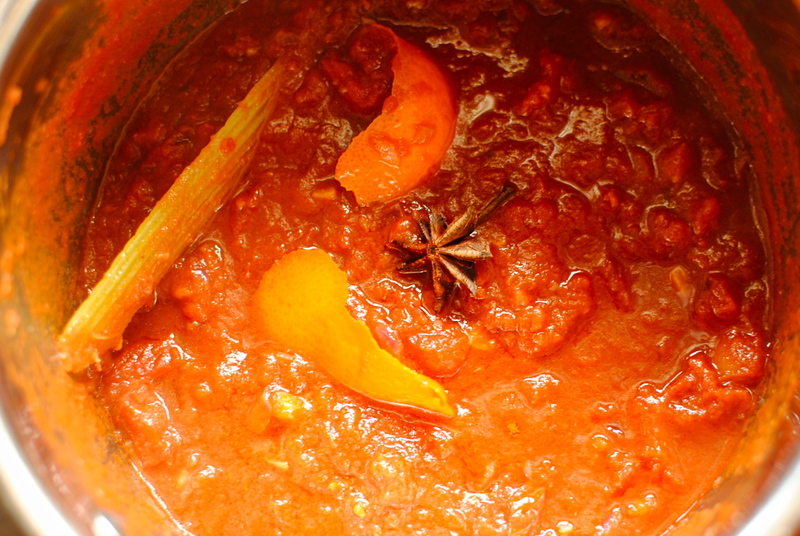 The rather generous amount of oil makes it extra flavoursome and takes it beyond tomato sauce into fondue territory. I made a double batch to save cooking time on another occasion, but have given measures for one batch. This is even better if it’s made ahead and gently reheated. 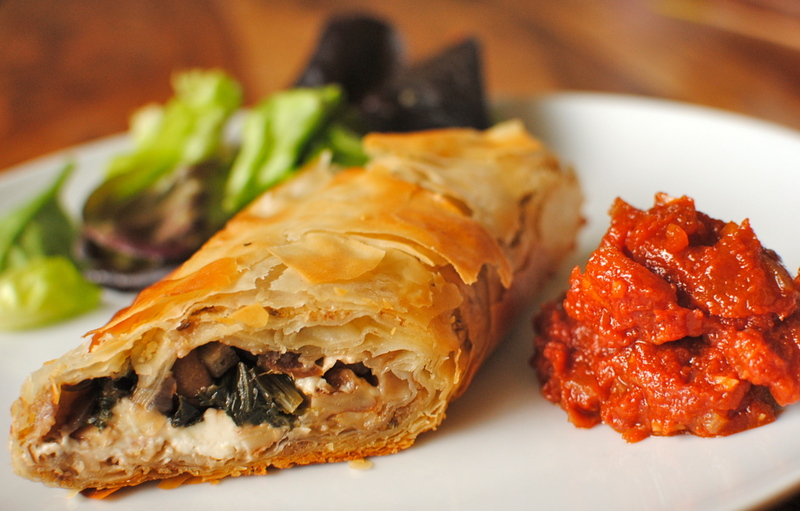 Both recipes are my way of helping to celebrate and promote National Vegetarian Week. More celebratory recipes to follow. And, after a few February-like weeks, here’s to the sun finally appearing in Scotland! Woo hoo! This recipe theoretically makes enough for 6-8 people (two strudels) but we couldn’t resist eating all the strudel and most of the tomato fondue in one go. But I’m sure you aren’t so greedy. Slowly sauté the onion and garlic for 10 minutes; the onions need to be very soft, so cook them as long as you need to without colouring them. When they are meltingly soft add everything except the vinegar. Bring to the boil, then simmer for one hour, stirring occasionally. Taste a little about halfway through cooking and add in a little sugar, to taste, After an hour add balsamic and simmer for a further 10 minutes. Adjust the sweetness again if necessary, bearing in mind all flavours will intensify upon cooling. Fish out the celery stick, bay and orange peel – and the star anise if you can find it! Let cool and gently reheat to serve. 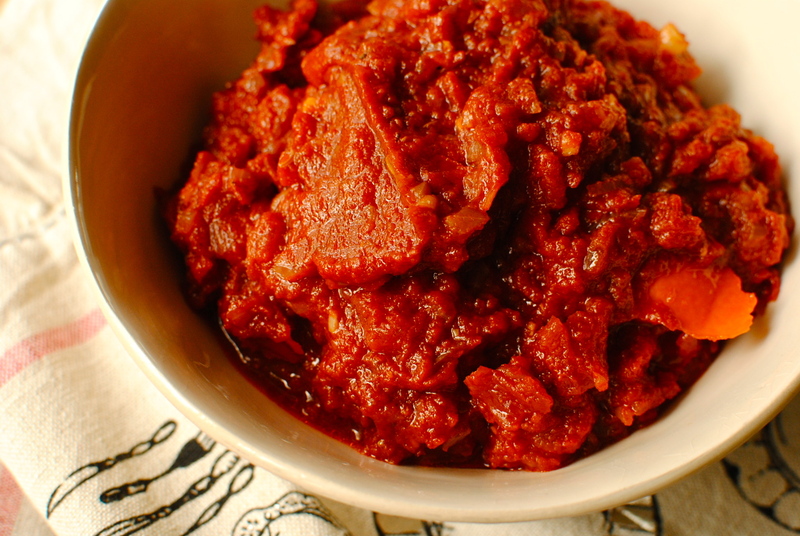 This is Miss R’s new favourite tomato sauce and can be used in a number of ways. It keeps very well and freezes too. Saute the onion and the garlic for a few minutes before adding the chard, dried & fresh mushrooms, fennel seeds and the walnuts. Slowly sauté until everything is soft – about 10 minutes on a low flame. 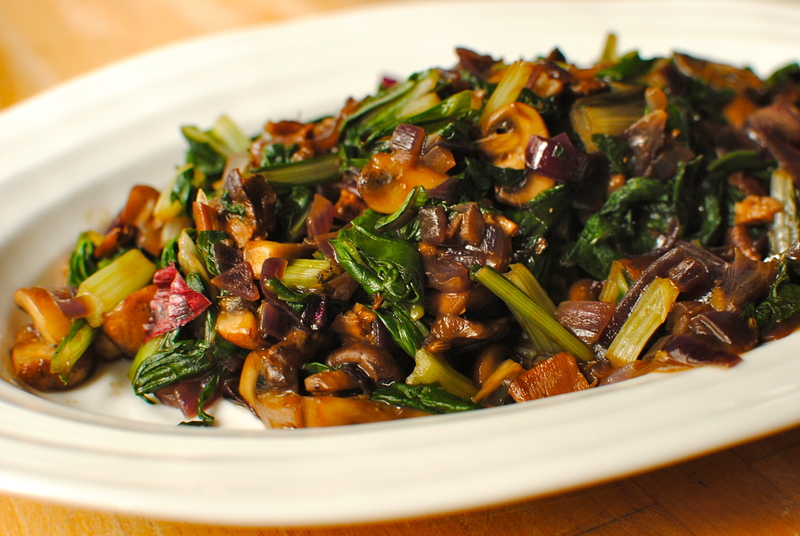 Stir the mushroom water into the cornflour and ‘cook in’ for a further minute until you have a slightly thickened sauce. Set aside to cool. 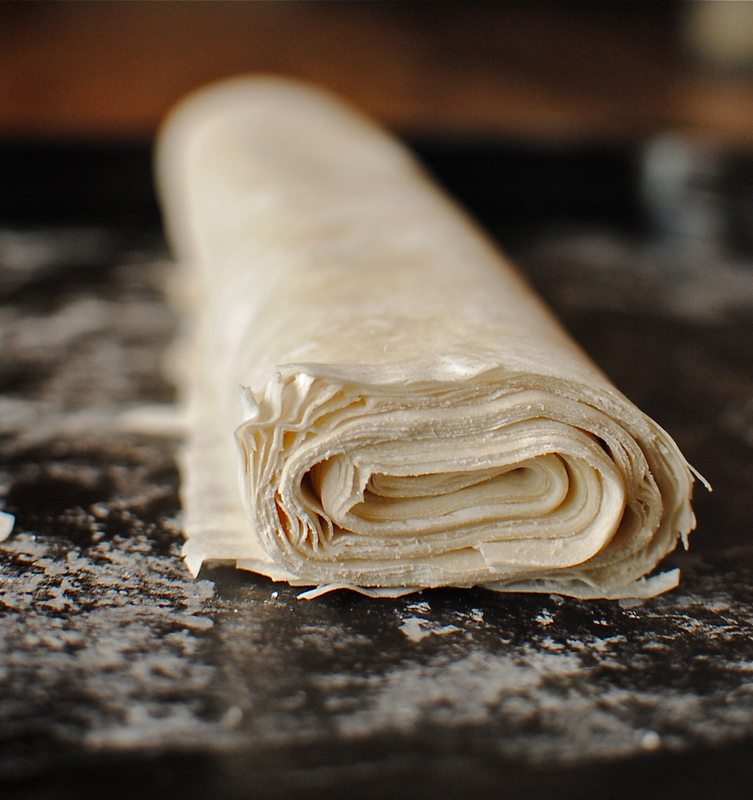 Melt the butter for making up the strudel and keep it on your work surface.. Take a sheet of phyllo and lay it on the work surface – cover the remainder with a slightly damp (not wet) cloth. Lay the sheet long ends in front of you. Brush lightly with some of the butter. Carry on with two more sheets. Now sprinkle over one tablespoon of the reserved walnut crumbs. 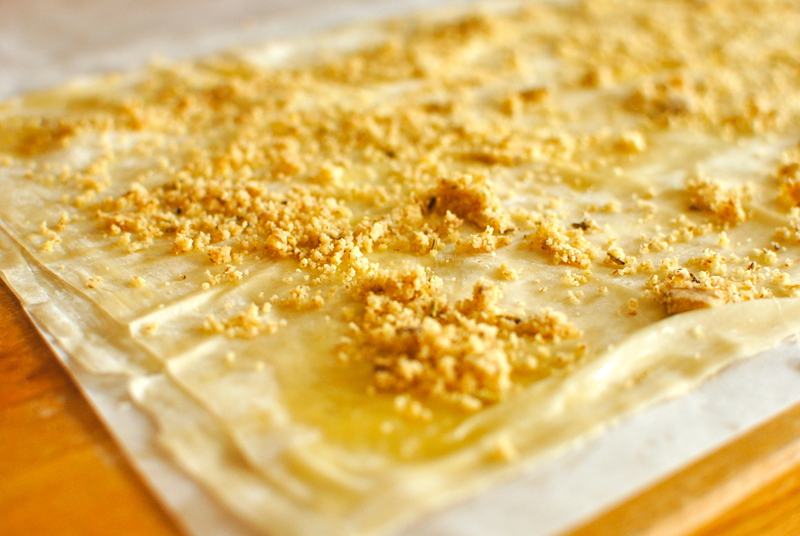 Add three more sheets of the phyllo in buttered layers. So, just so you are clear: six sheets of pastry for each of the strudels. 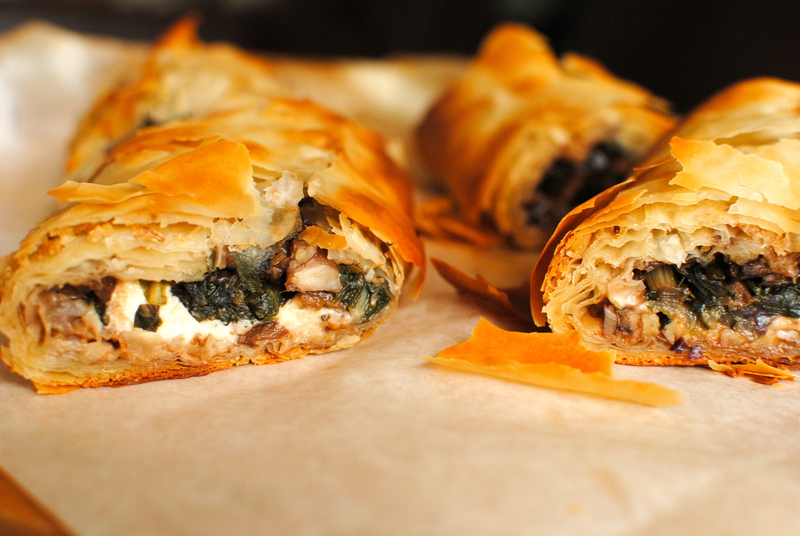 Spoon as much of the chard mixture onto the pastry as you dare, then top with nuggets of half of the goats cheese. Carry one with the other strudel. You may have some filling left over, so save it and add to some pasta later in the week. Bake the strudels on two large lightly greased baking sheets in a 200C/400F oven, for about 25 minutes. They should be deeply golden and a bit crackly. Let them cool a wee bit before slicing and serving with warmed tomato fondue and some green leaves. If I was clever I would have scored them into portions before popping them into the oven – neater but not any tastier! are you kidding me? the word “goats cheese” was what caught my attentioN! “National Vegetarian Week” We need one of those here in the US! OK…I have my next mission! if all your dreams taste this good… then, please, dream more often! That’s very sweet of you to say that. Mostly I dream about swimming in foreign countries, not usually about eating. I hope to have more such dreams cos swimming is tiring! I am in love. There are some recipes you know you must have soon and this just grabbed me as soon as I opened up your post, like a present on Christmas morning! I MUST make this as soon as possible. I’m buying phyllo on my way home. Awesome job Kellie. I wish I could frame your comment 😀 Your coconut rice recipe was the same for me – I HAD to make it there and then. So delicious, and so easy too. 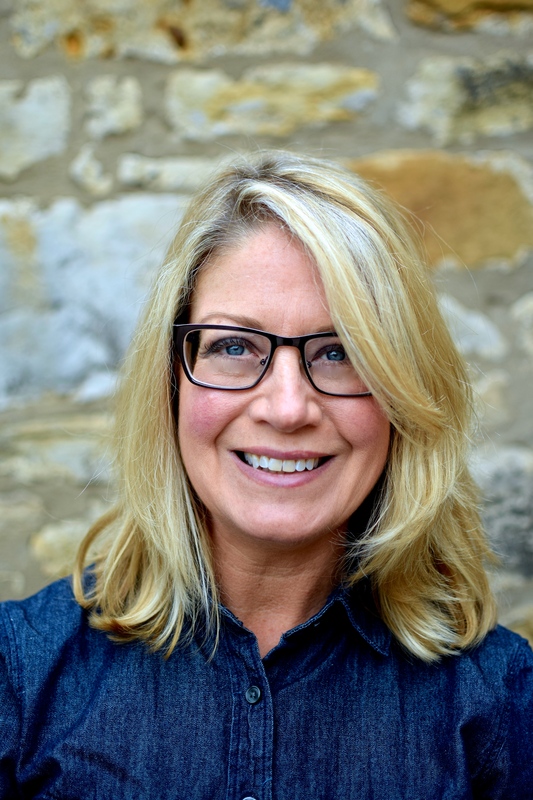 What an absolutely wonderful recipe Kellie….I ADORE chard and goat’s cheese is always welcome in our house, I always have some tucked away in the fridge! 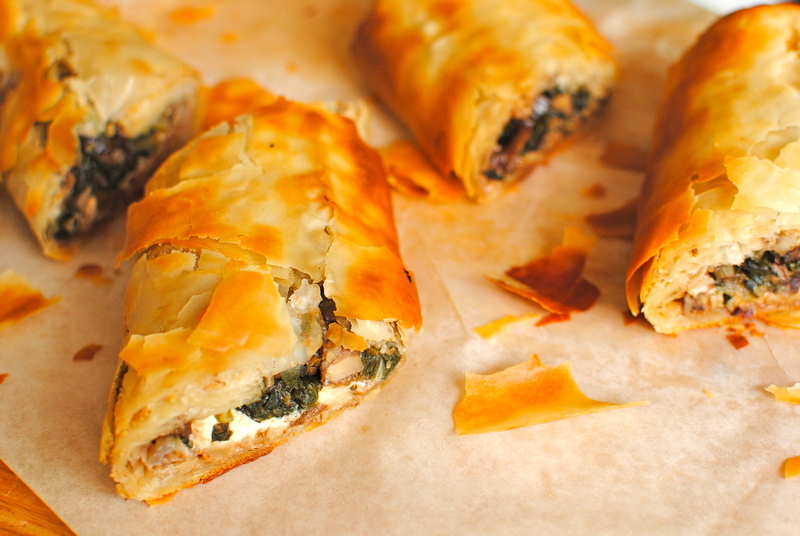 Funnily enough, when I used to run my restaurant in Cyprus, I used to make something similar…..chard, feta cheese and potatoes in filo pastry, and it was always a sell out meal on our menu! This strudel is amazing! 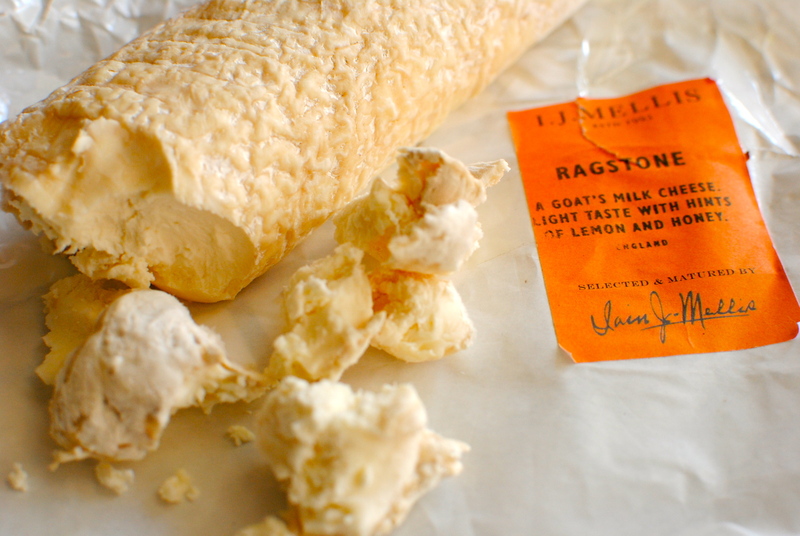 Great recipe and great blog! THanks so much, Lavinia. Thanks for commenting. You’ve out done yourself! 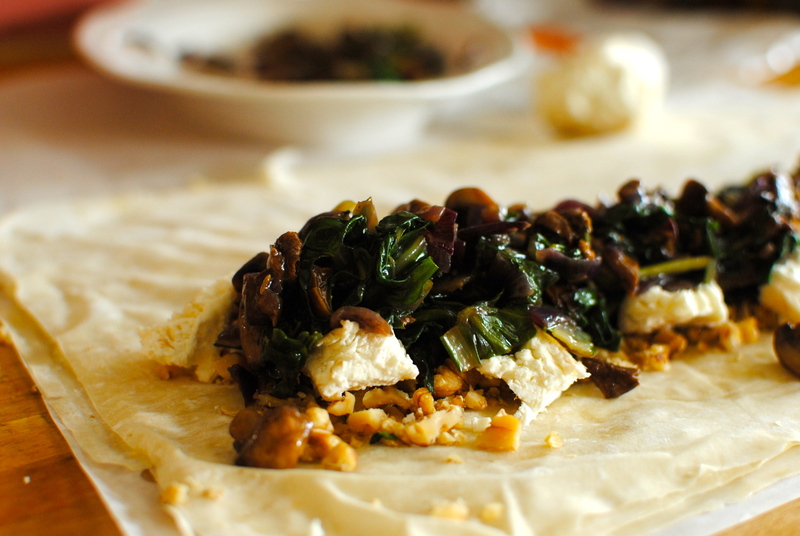 Pairing the fragrant tomato sauce with chard, goat cheese and walnuts is a fantastic recipe. Looking forward to more recipes fom your nightstand notebook! The notebook is usually scribbled with random things and fiction ideas, but I’m glad I wrote this down. Your comment is very kind. Oh wow….I really don’t even know what to say because it looks so delicious. Very kind of you to say. 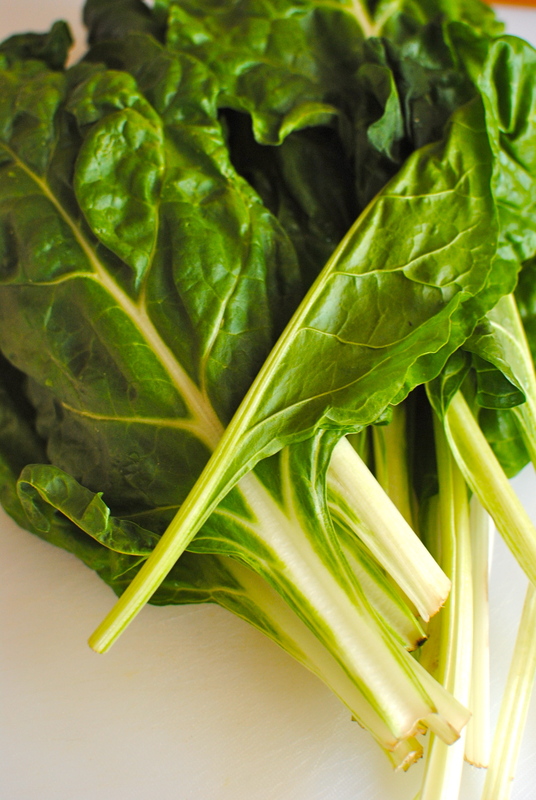 I wish my photography was better as I can’t really do justice to chard and green stuff for some reason! My mouth actually dropped when I saw this! It looks out of this world!! This looks absolutely unbelievable! After flying all day, your beautiful pictures are absolutely making my moth water! I can’t wait to try making this with lentils instead of walnuts (my sister won’t eat anything with nuts). Yummm!!! Oh yes, lentils would be perfect! But pine nuts could sub for the more assertive walnuts. Or how about hazelnuts? Hope you don’t have jetlag.